The spectre of foreign powers and their lobbyists distorting America's democratic system may worry ordinary Americans, but it seems that few inside the Beltway share their concerns. Over more than a decade, a Georgetown University professor has been clandestinely lobbying for Azerbaijan, but the university employing her does not seem able to detect any conflict of interest; a leading think tank and numerous media outlets also appear unconcerned. A small but oil-rich country between Russia and Iran that is ruled by a tragi-comical dictator, Azerbaijan is notorious for its rigged elections and human rights abuses. For more than ten years, while Azerbaijan's ruling family has progressively clamped down its opposition, Professor Brenda Shaffer has been publicly arguing that Azerbaijan is about to embrace democracy and freedom, and that it deserves the full support of the U.S.
A closer look at Shaffer's career reveals that she directly or indirectly benefited from Azerbaijan's financial largess throughout her academic career. At present, she works as an 'advisor' to the country's state-owned oil company, SOCAR, a financial relationship that only came into the open when the media got hold of a copy of her SOCAR business card. Presenting a written testimony to Congress that was apparently commissioned by DCI Group, a lobbying outfit then under contract with the embassy of Azerbaijan in D.C.
Astonishingly, such stealth lobbying seems to have become accepted behavior in American policy circles. Georgetown University also displays Shaffer's past op-eds, some of which had a strong pro-Azerbaijan bias, on its website, and lists her recent media appearances. Apparently, having such a prolific lobbyist on its faculty is something that Georgetown takes pride in. 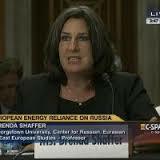 Meanwhile, Brenda Shaffer continues her work as a Nonresident Senior Fellow at the Atlantic Council. Her profile page at the prominent think tank does not mention her SOCAR connection - somewhat ironically, considering that the page contains a section headed "Full Bio". In 2006, one month after Shaffer was first publicly flagged as a foreign lobbyist by veteran investigative journalist Ken Silverstein, the Herald Tribune published yet another op-ed by her. This year alone, at least 20 more media outlets have cited Shaffer as an "expert", despite Shaffer having been (re-)flagged as a stealth lobbyist by journalists Robert Coalson and Casey Michel within the past year. An American political consultant with an academic background who often works for foreign clients himself offered me an explanation for this indifference to conflicts of interest within the Beltway. "She just kind of got caught doing what many many people do," he wrote in an email. "All those people want to minimize this too." Readers who want to learn more about Brenda Shaffer's case and the failure of multiple legal, democratic and ethical safeguards against foreign lobbying can read my two articles for OCCRP, linked in the text above. Researchers and fellow lobbying investigators who want to delve even deeper can read my paper "Distorting Discourse in D.C., How an Undercover Lobbyist Fooled the Beltway", which explores the case in great detail and provides dozens of references. Journalist Casey Michel has also recently written a paper on the topic.